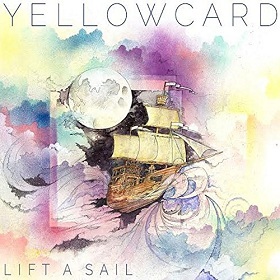 Lift a Sail is a song by Yellowcard in the Rock genre. It was released in 2014 by the Razor & Tie label. The artist's official site can be found at yellowcardrock.com. Some things are inevitable: The sun rising in the east and setting in the west, life and death, taxes, bad weather, and a new Yellowcard album coming out every year. After their brief hiatus from 2008 to 2011, Yellowcard has been releasing new content every year (with exception being 2013’s Ocean Avenue Acoustic) and have received critical acclaim for all their post hiatus work. Their newest album, Lift a Sail, ditches the signature second wave of pop-punk wave that the Jacksonville quintet has been known for the past decade in favor of a more alternative rock sound similar to bands like the Foo Fighters and the Black Keys. In a time where many people believe that rock music is dead, Yellowcard writes and produces a beautiful album with the help of new drummer Nate Young (drummer for Anberlin) adding his own flair to the album. The album starts with “Convocation”, a Hans Zimmer-esq album with Sean Mackin’s beautiful violin playing being the driving force behind the opening song on the album. The song directly follows into “Transmission Home”, a power-chord laded track that is the beginning of their new foray into a more alternative sound. The power-chords continue with “Crash the Gates” as we see the harmonies of Ryan Key’s and Ryan Mendez’s mix perfectly Sean Mackin’s violin playing. The album only picks up steam from there as we are treated to “Make Me So”, a more traditional pop-punk song that we are used to with Yellowcard. The next song, “One Bedroom”, could be the best song on the album. As long as Yellowcard has had main-stream success as a band, they have never had a really powerful love ballad. “One Year, Six Months” form Ocean Avenue was a very good song, but it lacked the heart that we hear in “One Bedroom”. “One Bedroom” is about lead-singer Ryan Key’s wife, former Russian snowboarder Alyona Alekhina. They were married on May 6, 2013, almost a full year after she was paralyzed from the waist down. Songs like “Fragile and Dear”, “Illuminate”, and “Madrid” are all solid songs, each brining their own unique presence to the album, whether it’s new drummer Nate Young brining his own signature sound which we first found in his stint in Amberlin or the new more alternative sounding track that is “Illuminate”. The album continues its trek with “Deepest Wall” featuring Matty Mullins from Memphis May Fire as the guest vocalist, an odd duet that has a surprisingly good outcome. The title track, “Lift a Sail” is beautiful. It is without a doubt one of their stronger songs in recent memory. The song is about many things, but many fans believe that the track (and album for that matter) is about a new journey into a slightly different music genre. However, after the title track, the album starts to lose its luster. “MSK” has an incredible violin solo by Mackin, but doesn’t offer much to the album. “My Mountain” isn’t anything too special. It sounds a lot like something from Ocean Avenue or Lights and Sounds (their sophomore effort). The concluding track, is the beautiful track “California”. One of the themes in just about every Yellowcard album is California. Whether it’s the Mecca that is seen as California is Ocean Avenue, to the overall negative feelings towards Southern California, most notably Los Angeles in Lights and Sounds, all the way to leaving California and returning to their home in Southern Air. The song is brilliant. The album has been all about a new alternative sound and their new direction, yet “California” features just Ryan Key and a piano. The song is about life. Not a life about moving on or sailing new winds, but about life and when we are at our most basic and vulnerable. Lift a Sail by Yellowcard is a beautiful album. Pop-punk music and rock music in general is struggling. Only a handful of bands can still bring over 10,000 people to a venue to see them. According to my brother only a band like Foo Fighters, U2, and maybe a Led Zeppelin reunion (fingers crossed) can sell out a venue like Sports Authority Field. But at the end of the day, its not about selling out huge venues; its about the music. Yellowcard is now close to being together for over 15 years and the members are all in their mid 30’s. They aren’t done. Theyre just getting started.